Make PHILLY Spinach Artichoke Dip extra creamy with three kinds of cheese. Include cream cheese, mozzarella and Parm in our PHILLY Spinach Artichoke Dip. 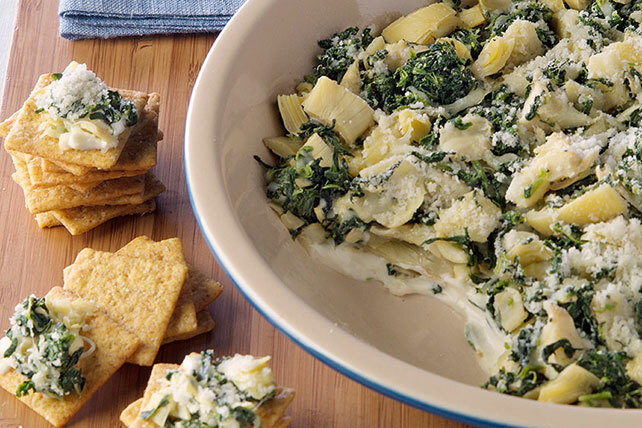 Mix spinach, artichokes, mozzarella and garlic powder until blended; spread over cream cheese. Sprinkle with Parmesan. Place completely unwrapped package of cream cheese in microwaveable 9-inch pie plate. Microwave on HIGH 15 sec. or just until softened. Spread onto bottom of pie plate, then continue as directed.